for their 12-year absence from our stages. In fact, Neil Tennant and Chris Lowe want to know why we haven’t asked them back before now. The enduring pop music supremos were quick to say yes  for the right money, of course  to joining the inaugural V Festival line-up. But Tennant is keen to showcase another of their labours here within the next few years, and believes their Battleship Potemkin project would be perfectly staged on Sydney Harbour. The Pet Shop Boys duo wrote a new score of orchestral and electronic music to accompany a screening of the 1925 silent film, The Battleship Potemkin, by Sergei Eisenstein in Trafalgar Square. While Tennant is right to be miffed about the lack of chart activity they have enjoyed here in recent years, the duo’s most recent album, Fundamental, will no doubt enjoy a festival-led resurgence. And then there’s Robbie Williams. His latest single, She’s Madonna, was a collaboration between the long-time friends. Tennant is quite excited when informed the download-only single is copping a right flogging on the Australian airwaves. The single was inspired by the trio of mates discussing the possibility of forming a pop super group. Regardless of the fickle fortunes of chart success, the Pet Shop Boys not only remain relevant but excitingly creative. Even the briefest of their online bios offers evidence of their massive influence on contemporary pop music  its sound, its look and its sense of humour. Their popularity among their peers remains at an all time high. Madonna was quick to enlist their remixing services for her single, Sorry. 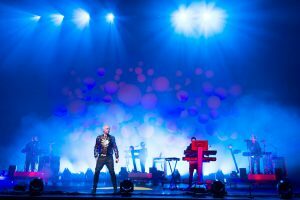 The Pet Shop Boys’ loyal Australian fans will be rewarded with an audio-visual spectacular which covers the gamut of their career from such hits as West End Girl through to I’m With Stupid, a single whose video clip featured a hilarious impersonation of the duo by the Little Britain lads.